One of the main upgrades to Trev is to increase the range of the car from 120 km per charge to over 250 km per charge. To do this, we have to fit a big battery into a small car. Actually, the battery will not be that big. Currently, Trev has a 45 kg battery. We need to increase the battery mass to about 85 kg. The mass of the car with the larger battery will still be under 400 kg. the large, flat cells are easy to fit into tight spaces. With most batteries there is a trade-off between energy capacity and power. However, high energy cells can deliver more than enough power for our low-mass car. Last week we lifted the car up onto trestles to check that there was enough room beneath the car for a large battery. There was. Design for the new battery box. 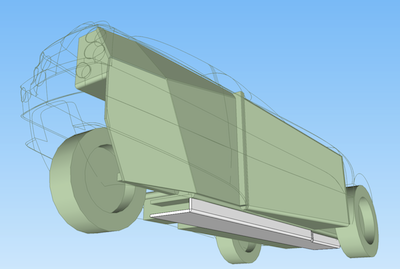 The diagram shows the structural tub chassis in green, and the proposed new battery box in white. The tub chassis is built from boards with an aluminium honeycomb core and fibreglass skins, with kevlar reinforcement on the floor. For the battery box, we are considering using polypropylene honeycomb with kevlar skins, which will be even lighter. The entire high-voltage system—battery, fuses, battery management system, contactors and motor controller—will fit into the battery box. The motor controller is taller than the battery, but will stick up through the main floor under the rear seat. This layout will allow very simple wiring, from battery to motor controller to motor. To accommodate the battery box, we will raise the car by about 60 mm. This will also allow us to increase the movement on our suspension so we can cope with rough roads. We will continue to use double wishbone suspension at the front, but will lengthen the suspension arms by putting the lower pivots on the underside of the main floor, where the battery box narrows near the front. This design improves the overall simplicity of the car, by putting all of the high voltage components together in a box that can be easily separated from the rest of the car. Now all we have to do is complete the detailed design and engineering analysis, then build it. Having the motor controller away from the driver is a good move (from what I remember), will be interesting to follow the journey, like to see how distance between recharges goes with bigger capacity battery. Trev is looking a lot tidier since you last drove it. Come out and take a look some time. We will post some photographs soon. Which motor and contoller setup are you using? In our racing motorcycle we used the Agni Lynch designed motor, as relatively high power weight with forklift type Kelly controller. This is an efficient package, although the racing stress on the motors caused us problems. I have looked at the ac options but there are significant variations in efficiency over the rev range –70% to 90% (not inc Controller eff). We are using a Vectrix scooter rear end, which will deliver 7 kW continuous and 20 kW peak. Cruising at 80-90 km/h will use about 4 kW. Our motor controller uses a Semikron power stage, and our own control stage.